An unusual cross-posting briefly blended satire with actual news. In a convergence of news and satire, readers contacted us on 23 January 2019 after spotting a post from the parody site The Onion that had been republished by Yahoo! News. 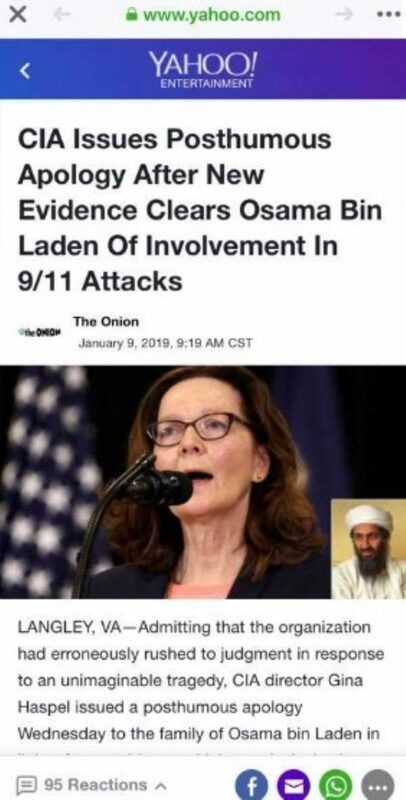 LANGLEY, VA — Admitting that the organization had erroneously rushed to judgment in response to an unimaginable tragedy, CIA director Gina Haspel issued a posthumous apology Wednesday to the family of Osama bin Laden in light of new evidence which conclusively clears the former Al Qaeda leader of any involvement whatsoever in the 9/11 attacks. It is unclear how Yahoo News picked up the Onion piece and slotted it for republication in their entertainment section, or why it was subsequently taken down. We contacted both sites seeking comment, but neither responded prior to publication.